So the heatwave in the UK is STILL going strong (isn’t this what this season should be like anyway?) which means for many of us, we’re craving chilled or frozen foods to help keep us cool. Plus the thought of cooking or baking just goes straight out the window when it’s already like 30 degrees C indoors. 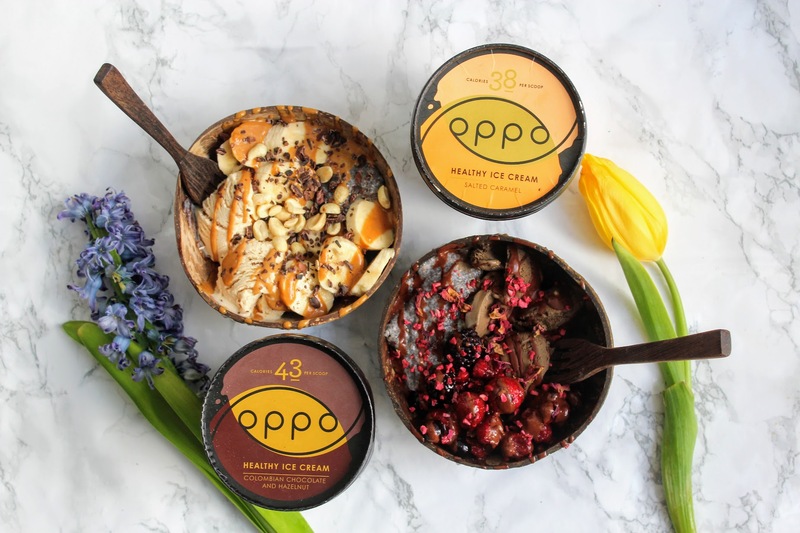 Ice cream is obviously an essential in summer and if you haven’t heard of Oppo’s healthy varieties, WHERE HAVE YOU BEEN. 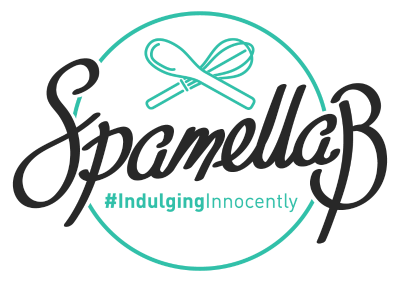 I met these guys years ago when they first launched, sampled the first flavours and was absolutely blown away: Creamy, sweet, tasty, rich but with around 40 calories per scoop. I know right! Since then I’ve been addicted, and yes I’m not even ashamed to say I might have got through a tub in one sitting. 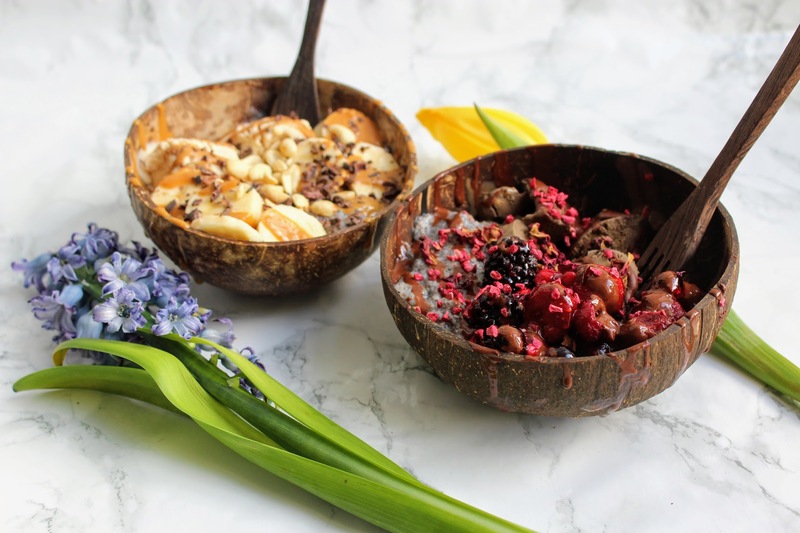 So this post is dedicated to one of my favourite frozen treats, combining the Salted Caramel and Chocolate Hazelnut tubs into refreshing smoothie bowls and chia pudding, which I’ll be honest I only enjoy eating when it’s served alongside something like this. Enjoy! First make the chia pudding: Mix together the milk, maple syrup, vanilla and chia seeds in a jar – whisk well. Seal the jar and place in the fridge for an hour to thicken the pudding. When ready to serve, divide between two bowls. 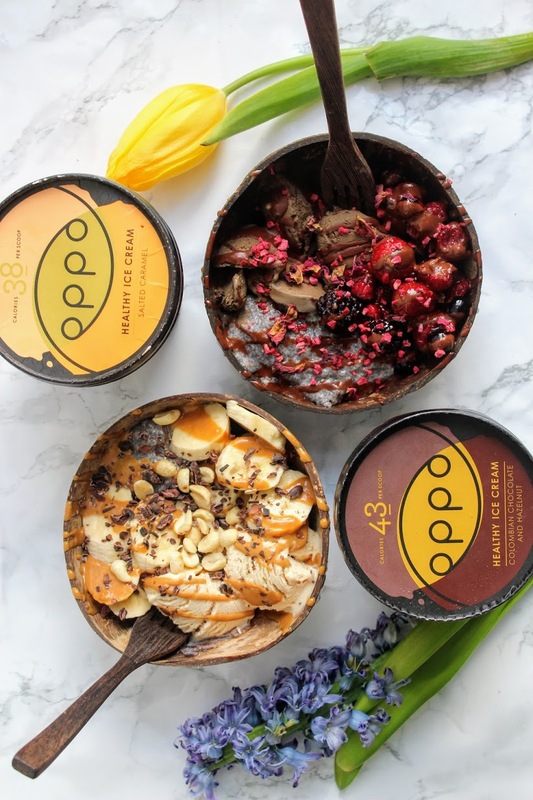 For the salted caramel bowl: Arrange the scoops of Oppo and sliced banana in the bowl. Whisk together the peanut butter, maple syrup and almond milk until smooth then drizzle over. Scatter over the cacao nibs and peanuts. 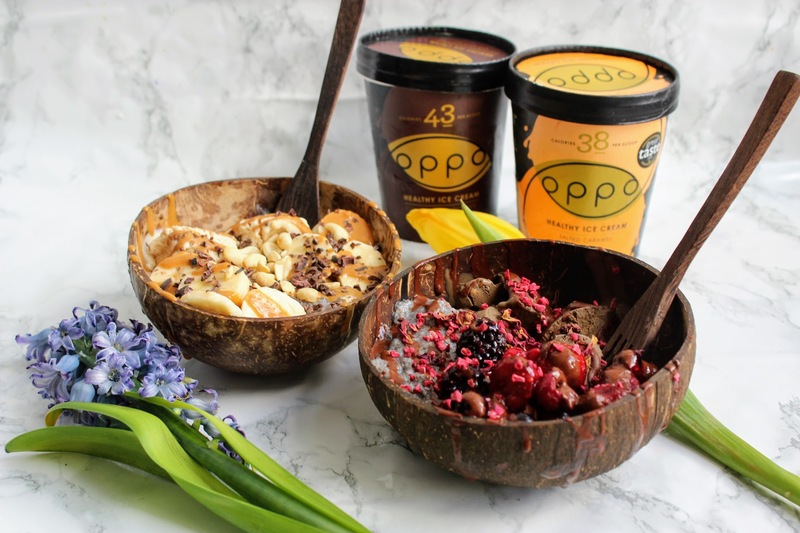 For the chocolate bowl: Arrange the scoops of Oppo and berries in the bowl. Whisk together the cacao/cocoa powder, almond milk and maple syrup until smooth then drizzle over. Scatter over the freeze-dried raspberries. Eat straight away!